A lot of my recent posts have been super duper long, full of photos and paragraphs that seem to go on forever, so today I'm scaling it back with a small post (a la Rhianna Olivia - Getting Back to Blogging Basics) to balance it all out! We had a spontaneous moment on Sunday that lead me to thinking 'this would make a great blog post!' how's that for serendipity? See we've all had those Sundays where there's a lot to do and not enough hours in a day (because whhyyy do all the shops have to close at 4PM?!?!) yet at the same time you're not really doing anything at all. It's mostly time spent in the car between popping in to see your parents and trying to make it to Tesco before it closes. Sundays can be a bit - meh. It's when you're frantically running round Tesco with your self-scanner while the overhead speakers blare that the shop will be closing in 10 minutes that you realise when you finally get home at half past 4 it will probably be a bit late for lunch. So instead you put the shopping away and crack on with dinner. Except dinner doesn't fill you up because, y'know, you skipped lunch, and you forgot to pick up any afters during your Tesco sprint and before you know it one of you is dozing on the sofa and it's not even half 7. 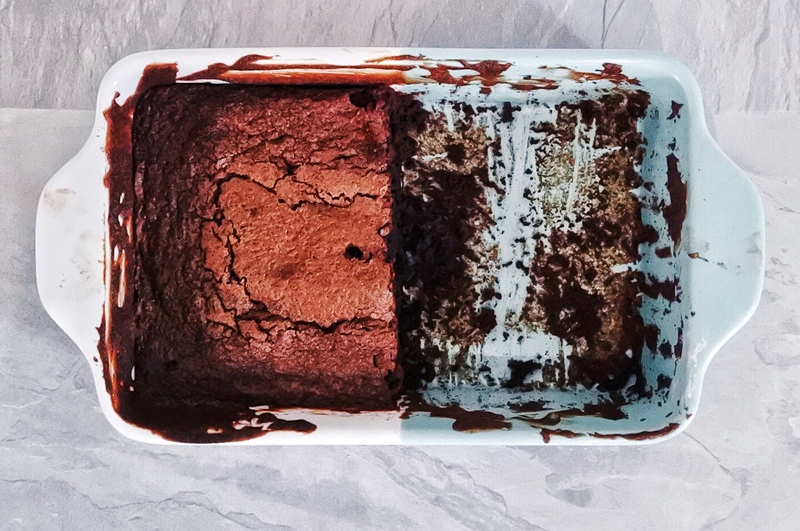 Just when you're wishing it was Monday because at least then you could be watching Game of Thrones an idea hits you - brownies. By some miraculous chance you bought eggs during your mad dash and that opens up a whole realm of baking possibilities. But it has to be quick, use as few ingredients as possible and not need anything fancy, like icing, to make it taste good at the end. So that's how I ended up waking Harry from his nap and thrusting Tanya Bakes at him while I frantically searched through Mary Berry's Baking Bible to find a chocolate brownie recipe that didn't use actual chocolate. Yes you read that correctly. 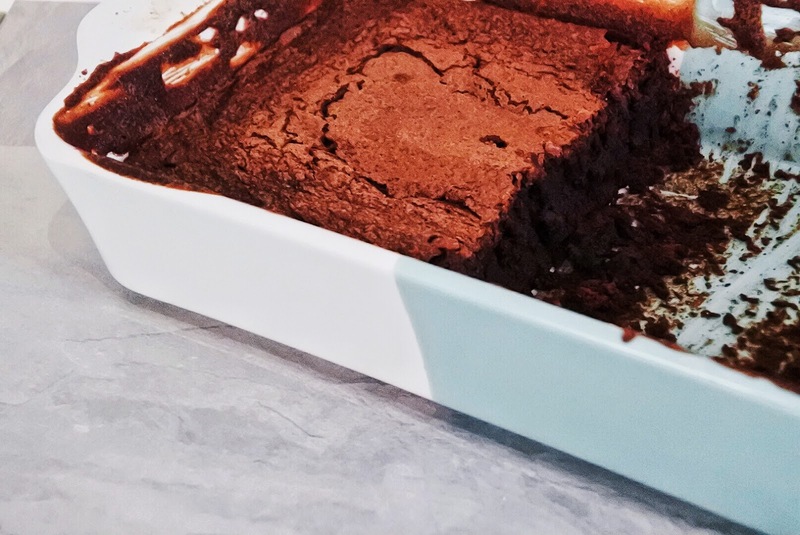 I usually use my favourite Hummingbird Bakery recipe that makes the fudgiest brownies but without a bar of dark chocolate to hand we had to kick it old school with some cocoa powder. I hit the jackpot with Mary Berry (she really comes up top every time doesn't she?) with a recipe that was literally put all the ingredients in a bowl, mix, pour into tin, bake. It took 10 minutes, maybe even less as I lost track singing along to the Moana soundtrack, and we halved the recipe (because we didn't have enough ingredients nor did we need a whole tray of brownies lying around). I was so impressed with how they turned out! I was expecting them to be more cakey, like a traybake, but they were actually fudgey chocolatey authentic brownies. We served up half of the dish while it was still warm with some double cream and it was the perfect Sunday night treat. Fancy seeing more of my Mary Berry bakes? if i was having a sunday nap and someone woke up by shoving these brownies in my face - i would marry them on the spot. that's the sort of support i need, you know? haha i'm glad i'm not the only one regularly mad dashing around tesco on the weekend. makes me feel better to know there's someone else out there getting their exercise in by completely a full weeks shop in 22 minutes!! !